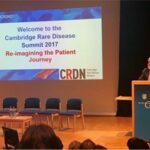 On 23rd Oct, Dawn and Allison had the fantastic opportunity to attend the Cambridge Rare Disease Network (CRDN) Summit 2017 at Robinson College, Cambridge. 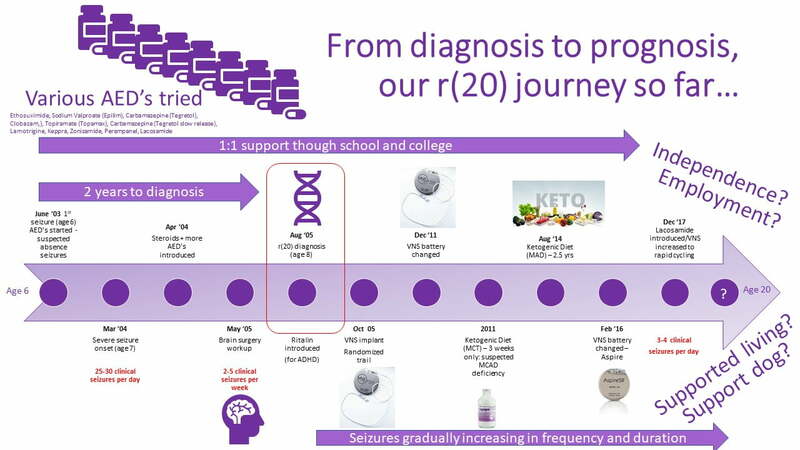 On arrival we handed over our patient journey posters (see below) and got ourselves signed in to some new tech to follow the conference on our phones/tablets, whilst in the auditorium. The new Glisser technology allowed us to follow all the speakers slides on our devices, and/or to make personal notes, to interactively ask questions during the talks (as well as see questions posted by others and ‘like’ them) and post slides with comments directly on twitter. It was pretty cool technical innovation, if not a bit hectic to keep up with everything! The event was opened by Alistair Kent OBE, Chair of CRDN. Kay Parkinson CEO of CRDN and Alstrom Europe who inspired the patient journey poster competition, as previously a chance poster presentation by Kay had led to collaboration to develop a drug treatment for Alstrom Syndrome. A great innovation of the conference, and real highlight for us was the patient journey poster competition. 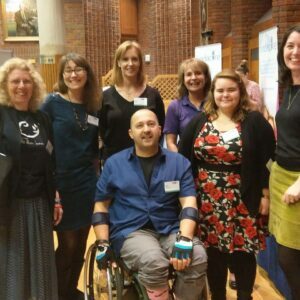 Prior to the conference we were 1 of 33 different patient groups who took the time to produce posters to summarise their rare condition and their own patient journey. 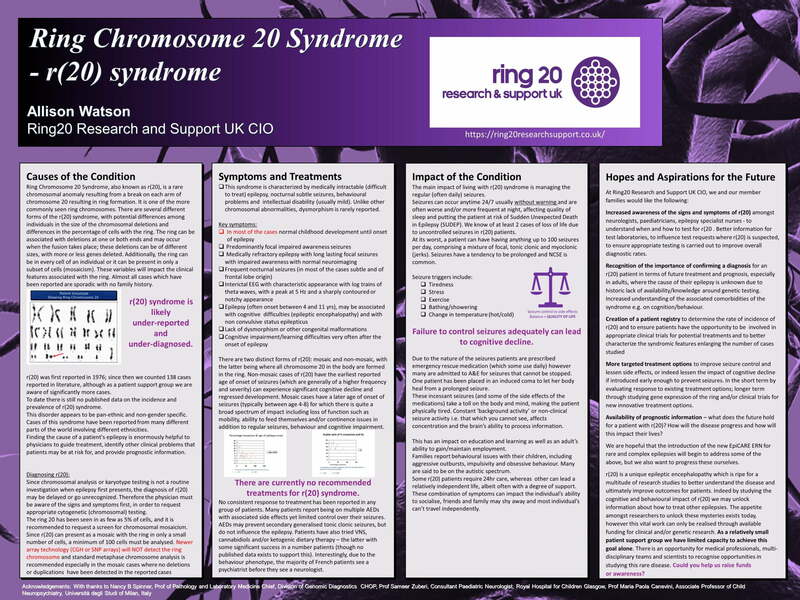 I (Allison) have never produced a poster before and have no background in Graphic Design, but with some guidance from the lovely CRDN team I gave it a go, because I felt the importance was in getting the word out about r(20) syndrome, how it affects us and what we want, not the quality of my artwork! 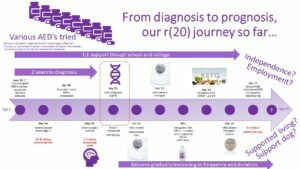 The posters were shared with all delegates in printed form so that everyone, whether clinician, researcher, life sciences worker, or rare disease patient, could read all about the impact of a multitude of rare diseases. 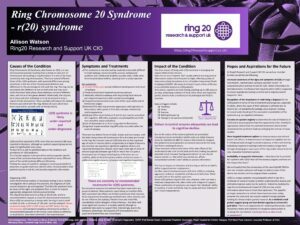 CRDN also have plans to continue circulating our posters at future events over the coming months, so the reach for raising awareness is huge. Even more excitingly five poster authors were selected to give a five-minute lightning talk during the conference, telling the audience a little about their condition and their three wishes for the future. Unfortunately, our poster wasn’t shortlisted as we were up against some very stiff competition, but it was great to hear their wishes, which were often pertinent to all! the advent of telemedicine and the need for a Rare Disease Nurse Network. 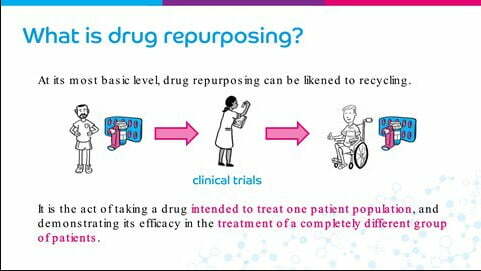 How do we get #RareDisease into the mainstream? Did you know that Rare Disease is more common than cancer and AIDS combined? At the end of the day there was time for a well-deserved glass of wine to reflect on the day with all attendees and a chance to meet up with a great bunch of like-minded people – representatives from other patient support groups; we call ourselves the ‘Rare Revolutionaries’ as we all subscribe to Rare Revolution magazine and are advocates for change in our own Rare Diseases! We look forward to meeting up again at future events and keeping in touch on social media. These guys teach us so much and the power of information sharing and networking is invaluable. Roll on the Rare Revolution!